TIGSource Forums Community DevLogs SpellDown! It has been quite some time since I posted a DevLog here so I hope this is for the best Here we go! SpellDown! is a lighthearted word building game which has you fighting monsters with magic. The game will also have some amount of dungeon crawling and roguelike elements. In SpellDown! you play the role of a young mage on a quest to learn magic. Your new found interest in magic and a need for a mentor takes you on a journey to a town known for being a watering hole for wizards. As a young apprentice you take on errands and quests for your mentors to gain more knowledge and power. But, in your quest for knowledge, you may have unwittingly triggered events that can have catastrophic effects and now you need to save the kingdom and set things right before the next pool championship starts! You use the power of "words" to craft "spells" to defeat these monsters, get loot and more. The game will also feature friendly town folk to talk and other ways to while away your time while not fighting monsters and improving your vocabulary. Most of last week was spent on working on multiple monster types that have varying levels of probability when it comes to spawning in rooms. These rooms will be part of the procedurally generated maps that you will be traversing. The last couple of days were a bit slow, so I got to implement a simple dialog system which showed messages, a yes/no prompt and an input dialog box. The game is built on top of cocos2d-x using c++. I’m planning to release it on PC and Mobile. At the moment most of my work is focused towards getting the mobile build up and running well, the PC version will need considerable ui/ux changes, but that is a challenge for the future. I hope to keep posting daily updates on TIGSource and keep doing these devlogs once every week, mostly on the weekend. Most of next week is going to focus on getting the dungeon map generation right, moving about in the Dungeon and some ux updates. Thank you for reading. Please do comment if you have any thoughts or feedback. More updates soon. A dramatic entrance of sorts, was working that tiny explosion. That's it for today and too tired now to go back to work, after going out an playing some football with friends -_- Hope I get a lot more done tomorrow. I had a late start yesterday and didn't get to really dig deep into what I wanted to do with the dungeon map generation, which I did today. The results were pretty good I was able to generate large maps as big as 100x100 within a fraction of a second, which was cool. Below are randomly generated maps with connected rooms. 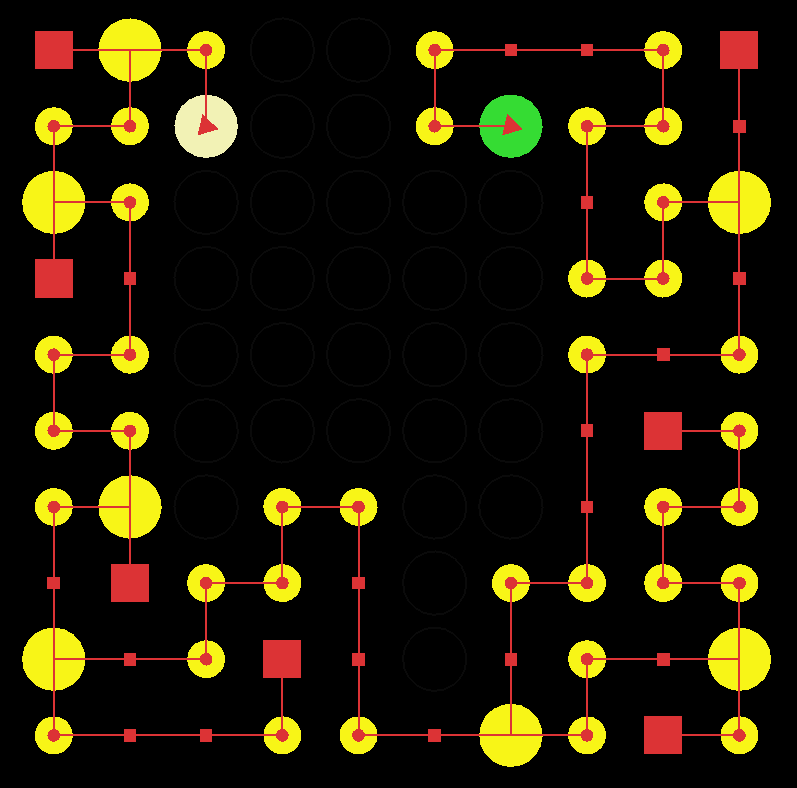 The green triangle is the start, the black triangle is the end; the red lines represent the doors/connections and the red squares are all dead ends. So in terms of number of tasks, I just have one lol. I love the dungeon visualisation and the ui animations you have going! I would be really interested to see how you are creating the ui. Is there some kind of animation system in cocos2d-x? Looking forward to more. At the very beginning, I started out using Cocos Studio (which is now EOL'd since 3.10 - but you can still get it if you want as mentioned in this post); and at that point I had just updated cocos to 3.14. Since I didn't want any complications in the future, I decided to ditch Cocos Studio and basically do things by hand. All of it is in fact a lot of actions(ease*, move* etc) called together or in sequence with delays. Sadly Cocos Creator is not really what Cocos Studio was and I didn't dig any deeper in that tangent hmm.